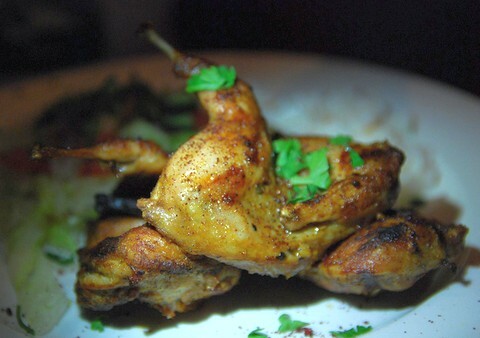 I love to cook and serve grilled form of quail spiced up with select flavoring agents. The following scrumptious recipe is quite simple and goes well both with flat bread and rice. You can add select fresh local herbs to experiment with the flavor. If quail is not available, you can use chicken though you'll miss the authentic taste. Fennel gives a sweet tinge while pepper complements it nicely. To get the best results, keep seasoned quail overnight before grilling. Instead of taking the whole portion, you can do with quail breasts too. And, if you like to fire up your taste buds, add red chili flakes to the seasoning. So, get your grill ready and make this lip-smacking grilled quail preparation in no time. Savor this grilled quail preparation which is delicately flavored with a combination of fennel and white pepper giving it a unique and aromatic taste. Except quail, mix all the other ingredients in a bowl and whip it for about 2 minutes to form a tangy, spicy and aromatic marinade. Pour it over chopped quail pieces and apply well with your hands. Cover and seal the marinated quail with aluminum foil and refrigerate overnight. Grill in a preheated oven at 350 degrees for about 8 to 10 minutes. Squeeze fresh lime juice on grilled quail and garnish with coriander leaves.